يحظى فندق فندق ريدجز بلازا كيرنز بمكان متميز في محور المدينة والاستمتاع بـ مطاعم, سياحة, شواطئ في هذه المنطقة الفاتنة. يحظى هذا الفندق ذو 4 نجمات بمكان ممتاز يسمح بالوصول إلى المعالم السياحية الأكبر في المدينة، فهو يبعد مسافة 1. Km عن صخب المدينة. يقع هذا الفندق الحديث على مسافة قريبة من المعالم السياحية الشهيرة. إن فندق ريدجز بلازا كيرنز حريص على توفير الراحة للنزلاء، فلا يوفر الموظفون جهداً في تقديم أفضل الخدمات وضمان حسن الاستقبال. يقدم هذا الفندق العديد من الخدمات الكفيلة بإرضاء أكثر الضيوف تطلباً. تتضمن كل غرف النزلاء وسائل الراحة والتسلية المصممة خصيصاً لضمان الراحة القصوى للضيوف. يمكنك طلب اللائحة الكاملة للخدمات في الفندق ومن بينها مركز للياقة البدنية, ساونا, حمام سباحة خارجي, حديقة. يشكل فندق ريدجز بلازا كيرنز بخدماته الراقية وموقعه الممتاز، قاعدة مثالية للاستمتاع بإقامتك في المدينة. 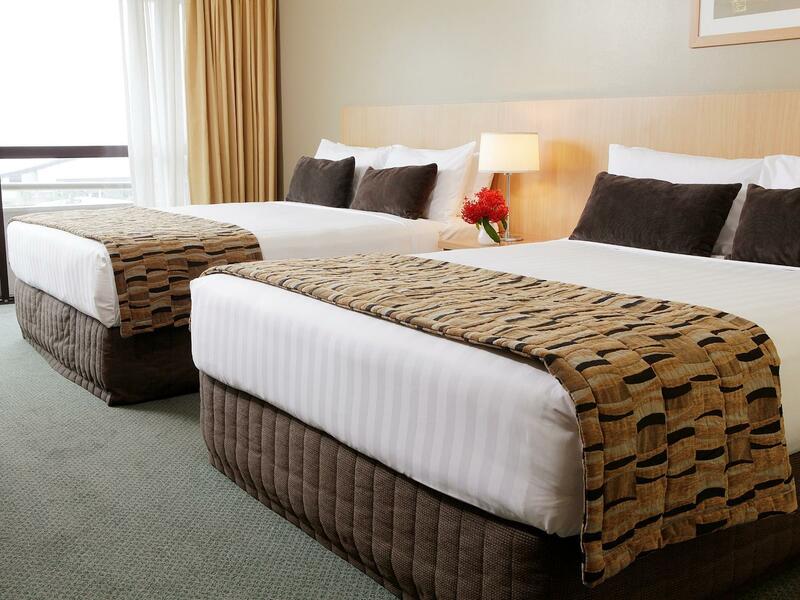 This hotel is situated right in the heart of the city walking distance to everything. The staff were very helpful and friendly. The breakfast was great. This hotel was exceptionally great value for the money. Recommened for those that want comfort within a budget. The team were delightful. The location was great! The room was a decent size standard room, as with most places furnishings slightly dated but at the same time accommodating for all the new technology. The facilities were lovely, I wish I had more time to spend relaxing around the pool or in the bar area. Booked a twin room but we were told that there was only one bed in the room upon check in. Luckily they managed to split it up into two beds. The room was a little bit over rated for a delux room in a 4-star hotel. The pool was nice but there was not any showing facility, only one toilet to get changed. 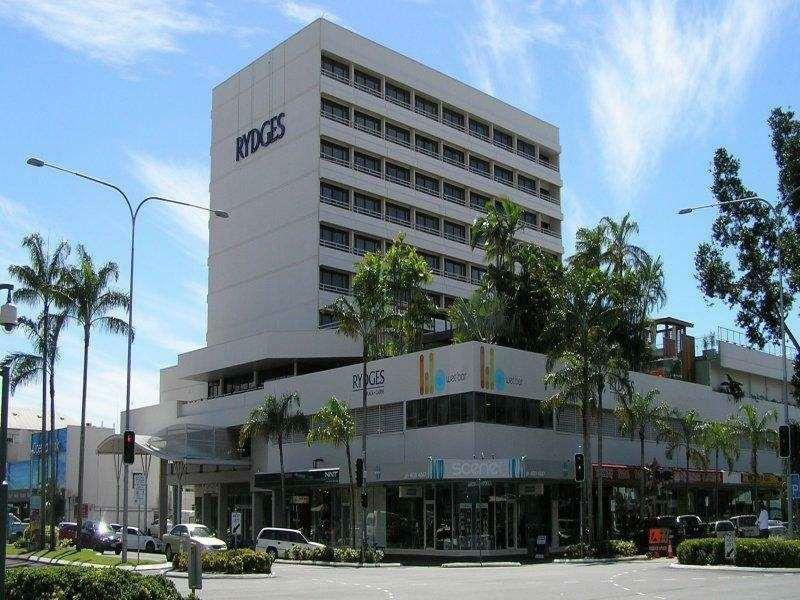 We enjoyed our stay at Rydges Plaza. Stayed 5 nights and was pleased overall with the stay. Firstly the location is superb. In the middle the CBD in cairns. Next door to Gilligan's if you are looking for a bit of nightlife action. Close to shops for food and booze. For the price range it was great. room was nice. Overlooking the pool and a table outside. Just a standard room, but clean inside, beds large and comfortable. Complimentary soaps provided were not your average plastic wrap soaps either. WIFI included and worked fine for all of our stay. Only slight negative was the TV, bad reception. But really who cares about the TV on holidays. Also a big thankyou to the staff who were really good. I left my charger in the room and they called me a few days later to see if I wanted it back. Of course I did! Thanks! The staff were really good. Attentive and friendly. Two best things about the stay were the location and staff. I will stay there again if in Cairns. Stayed here only cos the Xmas party was in the same building. Was not worth the convenience. Could have stayed at the brand new Crystalbrook Riley for the same price. And it would have been a 5 star experience. Old and outdated everything. Service was average at best. Slow service in the restaurant. 4 tables were left uncleared at one time during the breakfast service. 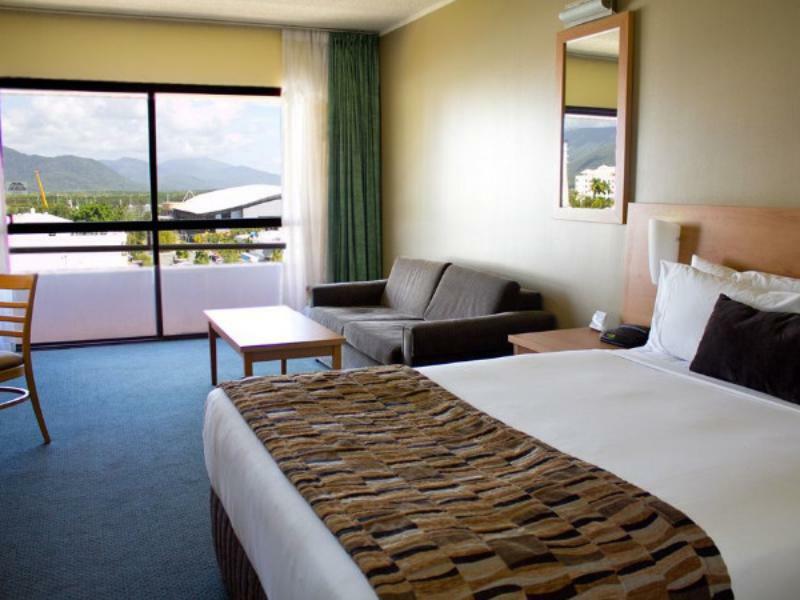 Seriously look around for better options in Cairns. Found hair in shower after finding some the following day relised it belonged to the cleaner. Could not turn air con down to cold Very noisy on the side of building we were on. Desperate need of upgrade mouldy bathroom, ceiling falling off around air conditioning. Beds were comfortable one good thing. Considered checking out. We’ve stayed here a lot. I have to say the staff are fab. No matter who we get its always a pleasure. Well done guys. It was nice. Comfortable beds, good location, basic bathroom amenities, tea and coffee, no free water. Free wifi. Just a nice comfortable hotel. Overall recommended for it's value for money! Sunset view from room with big glass windows, comfortable bed, very spacious room. Nice pool area too to soak in the sun. Good location, right in the centre of city, restaurants and bars, and only 15mins nice walk to the Esplanade. Didn't get the try the breakfast/ restaurant/ bar there but vibes and crowd looks decent! Only thing I didn't like was the bathroom which looked old, and bath tub leaked a lot of water out to the floor.. Frankly, I would choose another venue if I was paying full rates. For what I paid, it was OK. Stayed on 5th Floor. 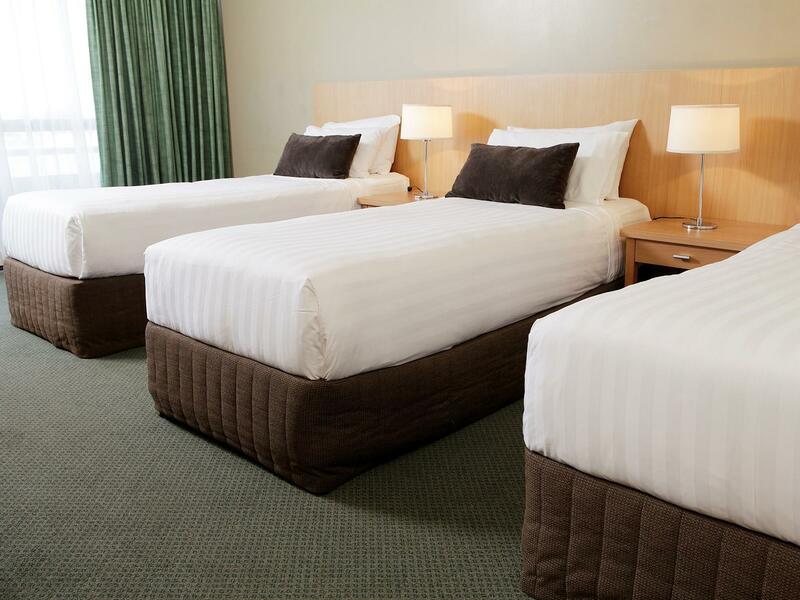 The mattress was new and comfortable and the location was great with only a few minutes walk to all of the CBD. and yet reasonably quiet traffic noise wise. Aircon was very functional but a bit noisy. Careful of the hot water! It is very, very hot. The room(s) needs a good make-over. The interior is a 1990's look and it is getting a tad old in the room I was in (including bathroom). Room comfortable. Great view from small balcony-not big enough for a table & chairs. Bed okay. Walking distance to coffee shops esplande & restaurants. Pool was clean & refreshing. We ate at the hotel restaurant which was enjoyable & food tasty, barman was excellent. Would stay again. Overall a really pleasant and great experience for us. The staff were very friendly and we got a free room upgrade on check in. Really tidy rooms and bathroom which were both updated and looked great! Always came back to a cleaned room and bathroom each day (noticed the floors had been shampooed too - which if you like cleanliness like me was a big bonus). Also the beds were amazingly comfy! Great night sleep each night. We loved the location as we were a short walk to the esplanade with the restaurants, the pier where all the reef trips etc sailed from and close to a Woolworths (which is great for us so we didn't have to waste money for snacks on our trips etc!). 5 mins away from everything, the esplanade, wharf, restaurants, shopping mall and unfortunately the huge backpackers across the road. It wasn't too bad but there were a couple of nights out of the 4 that I was woken in the early hours by partiers coming home. rooms basic - ceiling filthy from air con but rest of the room ok. It's an OK hotel but badly needs refurbishment. The toilet ceiling keeps flapping up and down and making sounds. The staff were great though. A nice friendly welcome. The location is good if you want to go out and dine.the pool is nice.